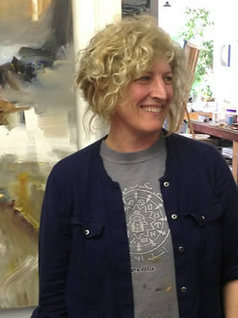 ​Lisa Johnson's paintings inquire into space and movement within the context of landscape painting. Through her ethereal and sculpted pigment Johnson depicts vast landscapes where figures seem to poetically emerge. Drawing inspiration from on-location studies to develop large studio works, her paintings weave geographic, corporeal, and abstract sensibilities through layers of atmospheric grounds and gestural mark-making. 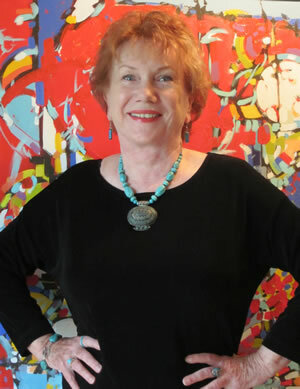 Her work speaks to the passage of time over an evolving landscape painted with spirit and musicality. While Johnson was born in Toronto, her family’s roots in the shield country of North Frontenac – specifically Bon Echo, Mazinaw Lake -- continue to serve as one of her prime sources of inspiration. A near death experience changes everything. Once my art was often about women – their rights, their history, their challenges. I used photo collage, textiles, embroidery and paint. Then came a serious health crisis and with that a sense of time as narrow. Returning to my studio, I felt a different focus. From mixed media to a single one: acrylic. With this change I began to draw freely on canvas. I put the canvas on the floor and drew in dark brown acrylic paint with my brush attached to a three-foot long dowel. It is impossible to be rigid with this gestural technique. The painting takes on an immediacy for me and I respond, building the work with strong, intense colours. ​My intention is to understand concepts of individuality and the experience of women as both powerful and vulnerable. Through active, almost chaotic line and brilliant colour, I confront the complexity of identity, gender and a need to re‐invent myself after 40 years as a wife and mother. My current challenge is to navigate life as an artist and find my place among the female artists who have preceded me. After much initial self‐doubt, I have come to know and trust my inner self and personal growth. ​I found a source for making art that allows me to reveal that which is private in a way that resounds as a universal truth. This public exposure becomes an on-going motivation. These are not dark paintings. They are about the moment, intensely personal and immediate.